The 2017 Nashville Boogie presented by Muddy Roots is set to go off May 18th to the 21st at Nashville’s Opryland Resort and the nearby Nashville Palace, and they have just announced that Jerry Jeff Walker will headline the event Sunday night (5-21) at the Grand Ole Opry House. According to Muddy Roots, this will be the first time Jerry Jeff Walker has played a full set of music in Nashville in 20 years. 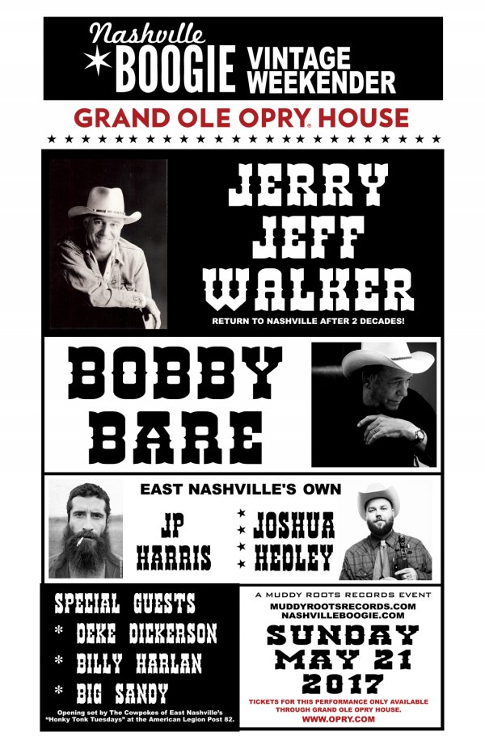 Jerry Jeff Walker will be joined by another original country music Outlaw, Bobby Bare, as well as local Nashville talent J.P. Harris and Joshua Hedley for the event on the Opry stage Sunday evening, and folks can attend autonomous of the Nashville Boogie if they wish. 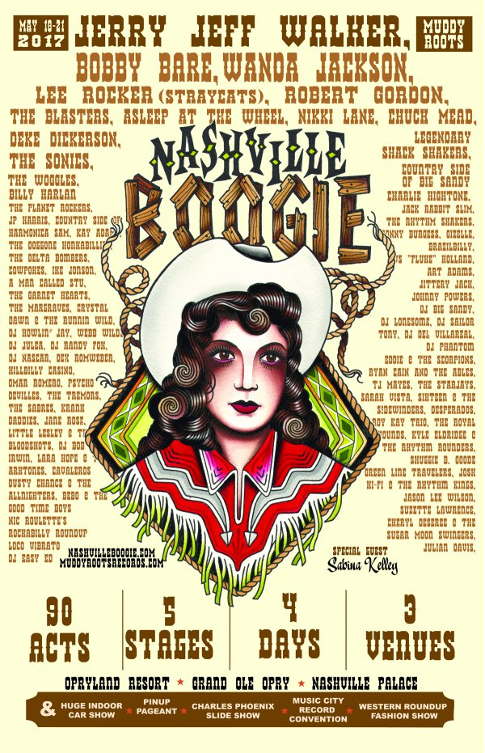 The Nashville Boogie itself will feature over 90 acts on five stages, including Wanda Jackson, Nikki Lane, Chuck Mead, and Asleep At The Wheel among others. The event also boasts an indoor car show, vintage market, western fashion show, pinup contest, and a record convention on Sunday. Certain events are cheap or free even if you don’t buy a full festival pass. 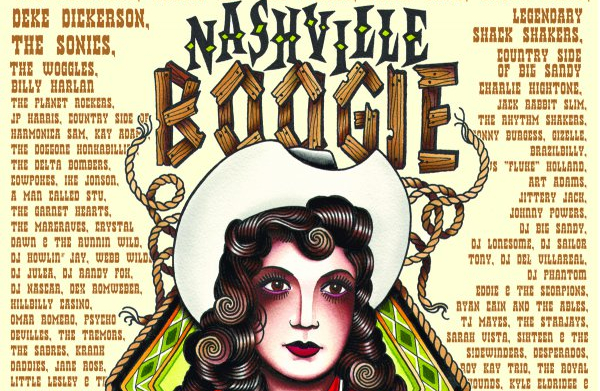 For more information and to purchase tickets, visit nashvilleboogie.com . A few years back I saw Jerry Jeff, Ragweed, and Boland all play in the same day at an outdoor thing. Jerry Jeff looked old but played longer and louder than anybody. No demise. The promoter just inked a 5 year deal on the event with Opryland. I’ve been to all of them thus far and it’s a cool deal.Very retro and many folks dress in vintage western and Rockabilly styles.It’s kinda like a Viva Las Vegas but with emphasis on western swing and old timey country as well as rockabilly. Killer lineup this year, Asleep at The Wheel, Jerry Jeff, Bobby Bare, and I’m happy to see Jp Harris, Josh Hedley and Nikki Lane in the mix. I will be attending. With my head apparently in the sand, I don’t know much about Jerry Jeff Walker – but I’m starting to dive into his discography – and I’m really digging it. Sunny Sweeney’s cover of “I Feel Like Hank Williams Tonight” is one of the things that sparked my interest. So what are some of JJW’s best songs? I’ve heard LA Freeway, but otherwise I’m not sure where to start. Any suggestions?